After one last ululating trill, the first Muslim queen in Drag Race herstory has sashayed away. 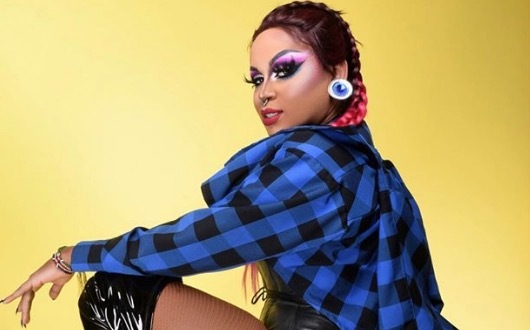 Mercedes Iman Diamond and Ra’jah O’hara were the weak links of a politically charged musical challenge, and Diamond was ultimately sent packing. Queerty caught up with her to talk faith, prejudice, and her time on RuPaul‘s Drag Race season 11. You’re originally from Kenya. Were you openly gay while living there and what was that like? Back home, you’re young and scared and you don’t know what’s going on. You feel like you’re out of place and worry that your family won’t accept you. So, I never came out back home. I never told anyone. I never had the opportunity to come out back then. But I moved to the States when I was young. I’ve been here for 20 years now and I get to live my life the way I want. Did you experience a culture shock when you moved to the US? How were you first introduced to the art of drag? I had never heard of drag before until I went to the Gay 90’s, which is a gay bar in downtown Minneapolis, Minnesota. They were having a drag show and I was sooo excited. I fell in love. I started to go literally every weekend just to see the show. I was in a hip-hop dance group when I was in high school, so when I became friends with some of the queens from the bar, I started back up dancing for them, which put me one step closer to doing drag. After a while, I finally worked up the courage to do a full performance myself. On May 22, 2009 I did my first drag performance. I had one costume and a cheap wig. From the moment I got on that stage, I was in love with the art of drag! And that’s where it all began. What does it mean to you to be the first Muslim queen on Drag Race? Before I would never tell people that I was Muslim. When I got on the show, I had to really think about how it would affect me and how it would be for other people. I come from a very strict, religious culture, so it was a huge decision. I talked to my sisters about it and they reminded me that it’s important to always live in my truth and live my best life. So I thought about that and decided that it was important for me to use as a platform to encourage other Muslim drag queens not to be afraid to live their lives and speak up and talk about it. You were very reluctant at first to discuss religion with the other girls in the Werk Room. What made you want to open up finally? Politics and religion are two topics that I always try to stay away from: with family, friends, and the world. Those are two subjects that can cause a lot of drama and even fights in some cases. So when they started to talk politics in the workroom, I just wanted to remove myself from the situation. But then, I thought about it and I realized that that was really rude to do without an explanation, so then I decided to open up and talk about it and explain because one, I never want to be perceived as rude and two, that’s a big reason why I came on the show in the first place — to give a voice to Muslim LGBT people around the world. So it was time for me to stop avoiding the subject and speak up and talk about it. Have you received any feedback from LGBT Muslim fans about how your casting on the show has affected them? Oh yeah! They were literally so supportive. They are happy to see a Muslim queen who is proud of who she is. They get to see that it is okay to be who you are and live your dreams regardless of what other people have to say, or what they feel, or how they think of you. You mentioned that you were wrongly put on the FBI’s “No Fly List.” Can you tell us more about that? Thankfully I’m not on it anymore, but when I was I went to the airport and the TSA lady was like sorry, I can’t let you in. And I asked why and she told me that I was on the “No Fly List.” Then she presented me with two options: to leave or to be arrested. Obviously, I chose to leave, but it was very shocking and it hurt me because I thought, ‘Wow, where is my freedom?’ Why am I being looked at and treated differently because of my name and how I looked? It was difficult and scary. Happy to hear they’ve taken you off! Switching gears: Who are your drag influences? Did you make any close friendships with any of the queens while you were on the show? [Laughs.] She may have had a point. What is your favorite song to lip sync to? My favorite song to lip sync to is anything that has an amazing beat, that I can dance to and connect with. What’s next for Mercedes Iman Diamond? To travel around the world and share my love with everyone. I’m literally booked throughout the year and I can’t wait to meet all these new people. I’m so excited for everything that’s coming up for Mercedes. Some of the stops I’ll be making this year are Australia, Hawaii and the UK, where I have relatives. We can’t wait to see you working it. Where can our readers find you on social media? She looks better with updos and short hair. Mercedes has the deck stacked against her. Islam in so many places is very harsh towards us. I hope she succeeds in changing some minds in our favor. Best of luck!